Xinxiang Bashan Aero Material Co., Ltd. (Bashan), affiliated to China Aviation Industry Corporation, is a specialized manufacturer that produces steel thread inserts for military and civil use more than 50 years. We attained ISO9001 certificate in 1998. Good quality, best price and large capability of production. Thread insert is a new type of fastener. 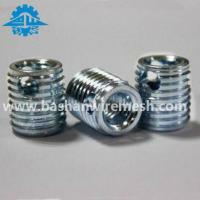 It is precision formed coils of stainless steel wire having a diamond shaped crossed-section. There are two forms: free-run type and screw-locking type. Screw-locking type offers a screw-lock effect by polygon elastic safety coils. Thread insert is used for manufacturing high strength, wear-resistant, high duty and vibration-proof in metallic and non-metallic materials such as Al, Mg alloy, plastic to form M and MJ thread. Now the insert technology has been widely used in many industries such as aerospace, aviation, electricity, instrument, and chemical fiber and so on. Having more than 50 years of experiences in this field, and with background of military technology, we can supply both Inch system and Metric system insert to meet customers' need, according to DIN standard. For detailed offer, please give me your specifications and quantity, package requirement, etc.